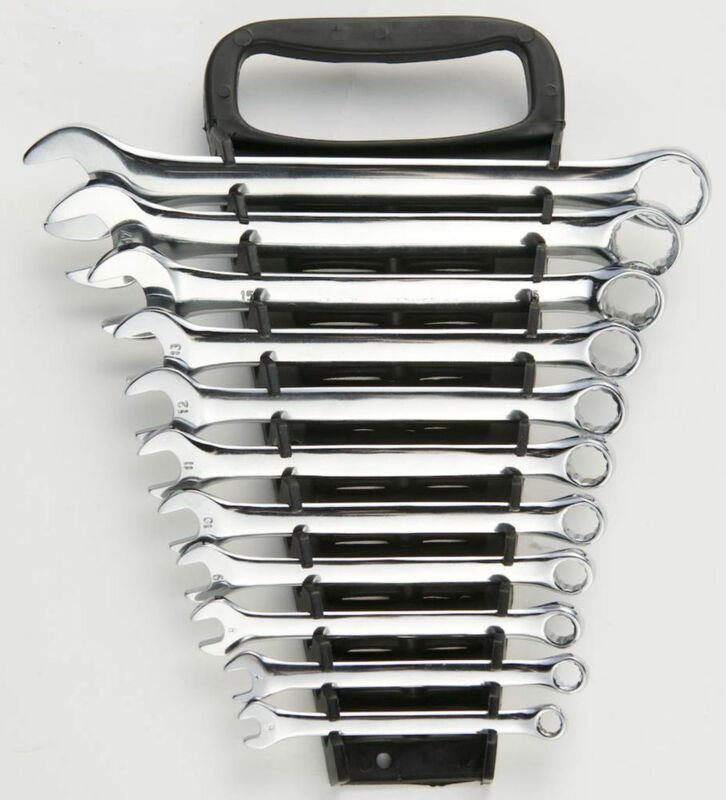 This offset ratcheting box wrench set makes short work of any repair job or renovation project, whether in the bathroom, basement, garage or even up at the cottage. The chrome-vanadium steel is engineered to withstand years of rugged use, while the chrome plate makes these tools rust-resistant and easy to clean. With an angled head for better clearance and a smooth two-way ratcheting mechanism, this 5-piece offset box wrench set is one you'll rely upon again and again. This 5-piece wrench set with flexible ratcheting box ends is an essential for any homeowner with a long to-do list. Manufactured from chrome-molybdenum steel for incredible toughness, with a polished chrome-plate finish that resists rust and wipes clean in a jiffy, the handy flexible ratcheting mechanism allows even the most novice of DIYers to place the wrench onto fasteners quickly and easily. The combination wrenches in this 12 piece set are precision broached for a tight and secure fit. The jewellery-like mirror chrome finish provides outstanding corrosion resistance as a result of our proprietary in-house plating process. Made in Canada and backed by Gray Tools hassle worry-free lifetime warranty. Pro Series SAE Combination Wrench Set (11-Piece) With its mirrored chrome finish and chrome-vanadium steel construction for strength and durability, this 11-piece SAE combination wrench set not only looks professional, but acts it too: featuring 11 of the most-often used SAE (Imperial) sizes of wrenches, heat-treated materials for hardness, a 12-point box end for precise fit and thin-walled construction that makes working in tight spots easier, these tools were engineered to work hard.